Don't Disturb This Groove: Kicking Myself...The One That Got Away! Have you ever been out shopping and saw something that caught your eye, but passed on it because you didn't necessarily need it? A few days ago, I was out and about running errands and I decided to stop by a Goodwill store in the area. I immediately went to the back of the store where the household items were kept. I browsed the aisles, but nothing really caught my eye. Before leaving, I decided to head over to the furniture section, not expecting to see anything worth taking home. Then bam, right before my eyes was this neat looking bar stool! It was in great condition and for $10, I thought why not! Then, this voice went off in my head that said, "Brandi, you do not need it, besides where would you put it?". I thought about all the other neglected pieces of furniture in my garage, waiting for me to make them pretty, so I left the stool sitting there. The minute I walked out the store, I knew I made a mistake. What was I thinking? I could have used it as a plant stand somewhere in the house! By then it was too late; I was almost home. As soon as I walked in the door, my husband asked if I had bought anything, and once I told him about the bar stool I left behind, he couldn't believe it. "That's so unlike you, why didn't you buy it and for only 10 bucks? Really Brandi?" From that point on, I was miserable. I moped around the house and felt sorry for myself. I even became really short with my husband whenever he asked me a question. He quickly responded "Don't get upset with me because you didn't buy the bar stool". Ugh...Get over it Brandi, was what I kept repeating to myself. The next morning, I called the store to see if by fat chance it was still there. And of course it was gone! I searched online just to torment myself to see if I could find something similar. 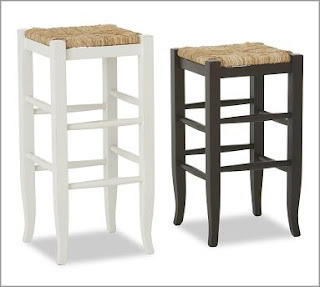 I found a similar stool on potterybarn.com but for $149, I declined. Not giving up hope, I decided to search Craigslist just for kicks! Then I spotted it...an ad for a pair of wicker top bar stools for $30 each or $50 for the pair. It was getting late so I decided to contact the seller the following morning. She wasn't available when I called so I left a message hoping she'd return my call. Later in the day she called me back and we agreed to meet the next day at a shopping center. I was a little nervous because this was my first Craigslist purchase and I've heard about all the things that could go wrong. Luckily, everything went fine and I had the pleasure of meeting a really nice woman that day! The bar stool came home with me and I feel much better about letting the Goodwill stool get away! PS. Between you me, my husband thinks I paid $20 bucks for the stool!!! Oh, I know the feeling! Once you decide that you must have it and it's gone.... Ugh! I love your husband's reaction. Very cute!! Lol, this post is so funny! I HATE that feeling when I realized I made a mistake by not making the simple purchase. I do that often! However your stool is the bomb! It looks so great where you have it positioned. Not to mention I would have never thought to use it as a plant stand! Thanks for the idea. Glad your Craigslist experience was a good one and regarding the cost...what hubby doesn't know won't hurt him lol. Oh Brandi, don't we all do that? My husband would have responded the same way. Then you're second guessing yourself all day. Geesh... if the PB version was that much, I think you got a bargain! Way to talk her down to $20 (wink wink). Glad your CL experience was a good one! Guess what? It's Saturday :D Have a good one! You scored Brandi! It looks adorable and you helped me. I have some wicker topped stools I replaced in my kitchen, and they will be perfect in my mudroom with my shelf and hooks! Thanks...great idea. Please stop by and enter my giveaway if you have a chance! I have done that sooooo many times, glad that you were able to find a barstool that works for your space. I wish you a fantastic weekend!!! Ugh, it's always such a mental tug-of-war to balance impulse vs what we need vs what we don't necessarily need but want and could use. Glad you ended up with a stool one way or the other! I love stools like these and hate it when you leave something behind because you figure you don't need it! Sooo been there! I've had things that I've passed on and kicked myself until I've found another for closure!!! Yup, I think it should be called Interior Closure!!! I have to keep looking and looking until I find one I *prefer* to the one that got away! I love it is this the entry way? Its perfect!I kicked myself on Sunday for doing the same thing but the item in question was a row of hooks just like you have here *sigh* I m feeling like I'll never get my entry way done. Well I am Pressing forward I will of course let you know how this turns out! I'm with ya sister!! Been there, done that (: I'm so glad you were able to find a replacement and it looks so good in your home too! I tell my hubby I paid less for stuff too..shhh!! Your stool looks great as a plant stand! LMBO! I definitely know the feeling! glad you were able to find your stool! But for future reference (coming from a craigslist expert, lol) Never pay full price-always negotiate, they want to sell just as bad as you want to buy . . .
ok, we won't tell. Looks cute with a houseplant on top. I've had reasonably good luck with CL purchases too. Good find!